We collect visitor statistics of users of the Dental Schools Council website. 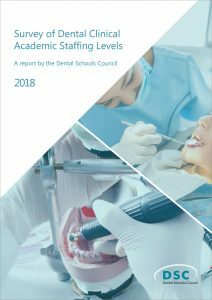 Every year, dental schools send some of the information held by them about clinical academic staff employed with a substantive university contract and an honorary NHS contract, to the Dental Schools Council (DSC). The Dental Schools Council is responsible for the database in which the information collected from dental schools is stored. The data is collected and used for the legitimate and lawful purpose of meeting the aims of Dental Schools Council. What types of personal data does the survey collect? Information about ethnicity or nationality will only be used in an aggregate level only and in accordance with the Equality Act. The information will not be used by the Dental Schools Council in any way to identify or make decisions about individuals. It is not intended to use information returned to DSC to make decisions about you. Data may also be shared to enable research on the clinical academic workforce. Shared data will only be processed according to the purposes set out in a data sharing agreement. Carrying out a public task in the public interest. This includes historical, statistical and research purposes. Carrying out duties to comply with the Equality Act 2010. Your personal data will not be transferred outside of the European Union, to third countries or international organisations. The Dental Schools Council will retain the data for as long as it is necessary. Some data may be retained permanently for historical, statistical and research purposes, and will subject to regular review. This is in line with the General Data Protection Regulation (2018) as the information will not be used to make decisions about individuals. The Dental Schools Council is a ‘data controller’ under the General Data Protection Regulation (2018). The Information Commissioner has been notified that we process personal data and the details can be found on the Information Commission’s Office website.